Spirit Train across the series. 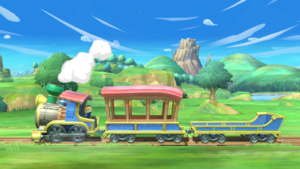 Spirit Train (汽車, Train) is a stage in Super Smash Bros. for Nintendo 3DS and Super Smash Bros. Ultimate based on the Spirit Train that travels through New Hyrule in the Nintendo DS game The Legend of Zelda: Spirit Tracks. The battle takes place upon the Spirit Train, which is constantly moving to the left during gameplay. Players who stand on the tracks behind the train get quickly left behind by the camera movement, similarly to the road in Big Blue. Anybody standing on the tracks in front of the train gets rammed by it, receiving damage and vertical knockback. Characters can fight inside the carriage of the train. The roof of the carriage is a soft platform. The train is also towing another platform behind it. Birds will occasionally carry another aerial platform on-screen. Players can also stand on top of the train itself. The train is being driven by Link, in his Spirit Tracks appearance. He stands in the background, and does not interact with the fighters. However, if Link, Toon Link, or Young Link (only in Ultimate) are fighting, Alfonzo will be conducting the train instead. In Local Wireless, neither of them appear, leaving the train with no conductor. Dark Trains and Armored Trains also appear on the stage. Armored Trains affect the train by ramming into it and pushing it towards the opposite blast line. Dark Trains may leap on the train (which can KO characters on top of it) and explode. The Dark Train may also dud once in a while, similar to a Smart Bomb. Players can additionally attack the Dark Train to detonate it. Any item that touches the tracks immediately disappears, except the Soccer Ball, Sandbag and Smash Ball. In Super Smash Bros. for Nintendo 3DS, the Ω form replaces the train with a flat platform resembling the flatbed rail cars. The stage is set higher above ground so the tracks aren't seen. In Super Smash Bros. Ultimate, the Ω form and Battlefield form are identical to the Ω form in SSB4; however, it is resized and reshaped to match Final Destination and Battlefield, respectively. The three soft platforms of the Battlefield form are unique to this form. 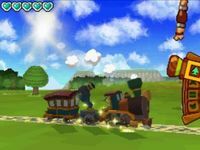 The Spirit Train as it originally appeared in The Legend of Zelda: Spirit Tracks. The Spirit Train first appeared in The Legend of Zelda: Spirit Tracks, where Link drives it around New Hyrule to reach various destinations. The Spirit Train's design is how it appears in Spirit Tracks with the Solid Passenger Car, which comes with the locomotive itself, and different rear carriages that can appear on the stage, one of them being the Trusty Freight Truck add-on from Spirit Tracks. Dark Trains are enemy trains in Spirit Tracks that attack by pursuing the Spirit Train attempting to crash into it, causing an instant game over. The driver Link wears his Driver outfit from Spirit Tracks. Spirit Train trophy in Super Smash Bros. for Nintendo 3DS. Spirit Train in Super Smash Bros. for Nintendo 3DS. Kirby and Pikachu inside the carriage. A close-up of the platform carried by birds. Spirit Tracks Link with Link. This situation cannot happen in the final release of the game. Link, Kirby, and Pikachu on the Train. Link and Pikachu. A Dark loco is in front of the Spirit Train. Fox jumping off the rear car, while it is presumably detaching. The rear carriage is carrying Linebeck Trading Company. A variation of the rear car featuring four platforms at different heights. Fox running on the tracks. Alfonzo acting as driver the train while Toon Link is in battle. Interesting note that Link's colors resemble Melee's rather than Brawl's. Alfonzo acting as driver the Train with Link and not Toon Link. Bayonetta using her forward smash on Samus on the stage. Daisy launching Link in the stage. Daisy next to Spirit Tracks Link in Ultimate. Dark Pit attacking Falco on the stage. Dark Samus with Lunala on the stage. Duck Hunt and Ike next to a Smart Bomb on the stage. Link using Spin Attack on Pac-Man on the stage. The Ice Climbers performing their neutral aerial on the stage. Mewtwo firing off a Shadow Ball on the stage. Wario teetering on the stage. Zelda in her dark alternate costume on the stage. In Ultimate, fighters who land on the track will be swept to the right at a faster speed that the train is actually moving across the track; more than double this speed, and as such it is never possible to outrun the train under any conditions. In Super Smash Bros. for Nintendo 3DS, a custom Sonic with all speed-based equipment under the effect of a Bunny Hood and Superspicy Curry is able to outrun the train. In Super Smash Bros. for Nintendo 3DS, if the player techs on the tracks, they will clip through the locomotive, and be placed in the frontmost carriage. In Training Mode, this will not work on 1/2 or 1/4 speed, as the player will simply land on the front of the locomotive. If Gerudo Valley and Great Plateau Tower are not counted, this is only Zelda stage based off a handheld installment in the series. This page was last edited on April 16, 2019, at 01:52.